I’ll admit it, I’m not above putting something out on Twitter in hopes that a brand sees it and takes action. This isn’t because I think anything is owed to me (heck, I bought the thing now it’s my problem), but because I work in an indsutry where I find it absolutely awesome to see brands out there listening and interacting with their customers. The other day I put my foot up and noticed a large crack in the rubber part of my Cole Haan boots. Now, these boots are seriously the most comfortable pair of shoes I have right now, so I was a bit sad to see this – especially in puddle-laden Seattle. To my surprise, I didn’t hear anything back from Nordstrom (granted, I wasn’t REALLY expecting anything back from them, especially since I didn’t use their Twitter handle). What I did get, though, were a bunch of great reccos from friends of places to take my shoes to get them fixed (including Nordstrom). 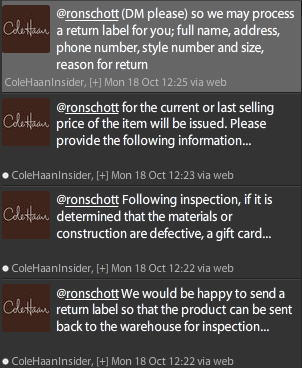 Regardless of what happens now (whether or not I get a new pair or a fixed pair), I’m still definitely going to be singing the praises of Cole Haan’s outreach and customer service on this one! It just goes to prove that when brands act more like people they can greately change the way consumers think, which is especially useful when consumers often think (and act) with their wallets.